Trading time frame: short term, medium term, long term etc. Type of trade: long or short, equity shares or futures & options contract etc. It is upto the investor to choose a stock or contract based on his investment capital, time frame and type of trade. After doing the analysis and entering a trade, one may find that the stock he ventured into is not going up; or in other words, the crowd is not all that interested. Two stocks with almost similar technical scenario may not be wanted by the crowd equally. Crowd may be acting based on some other information, such as rumour. So, technically, it is possible to analyze, apply the theory, evolve a trading strategy and enter a trade. But it is the market and market participants who will decide when the trader will exit from the stock successfully or otherwise. In this article we shall discuss about “hot” stocks. These are the stocks which are wanted more by the market crowd in case of gainers (or unwanted in case of losers). Stocks are listed based on percentage gain/loss since June 1 in descending order. Stock shall belong to either A category or B1 category of BSE (Bombay Stock Exchange). 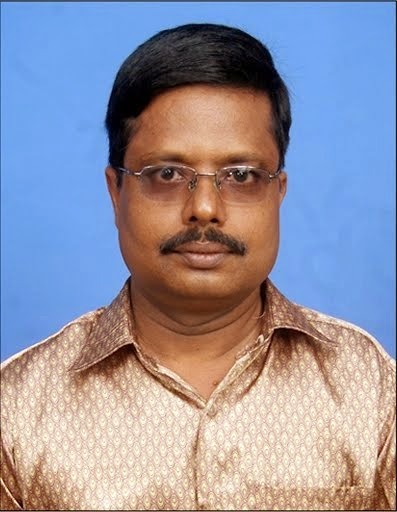 The idea is to avoid small companies which are traded in B2 category; others in S, T, TS or Z cateogy may have listing related issues and hence these are not considered. Let us see the technical picture of few of the stocks just prior to the excess demand or supply, as the case may be. Already we have discussed this stock in the weekly review dated 15/06/07. It is a case of bear trap. As the stock started forming lower highs and lower lows instead of breaking the previous wave’s resistance, bulls pushed up prices higher. This resulted in abnormal increase in price and volume. Just prior to the upmove the 21 day exponential moving average volume was around 20,000. Since 12/06/07 the daily volume has remained more than 400,000 ( highest was on 14th June, 3.9 million shares on NSE). This stock was also a thinly traded one, prior to this unusual demand. The 21 day EMA was around 3000 only. The resistance at 502 was broken on 08/06/07. On 13/06/07 only 482 shares were traded. The very next day 106,097 was the volume. On 20/06/07 the stock witnessed heavy buying with 681,956 shares being traded. It is said that, big moves take long time to consolidate. It has become true in this case. The stock was moving sideways since 09/03/07. After three months, it broke its resistance and the demand for the stock was high. This stock has been bullish in weekly charts. On 22/06/07 it made a high of 130.70, breaking its previous high of 130 on 01/03/01. 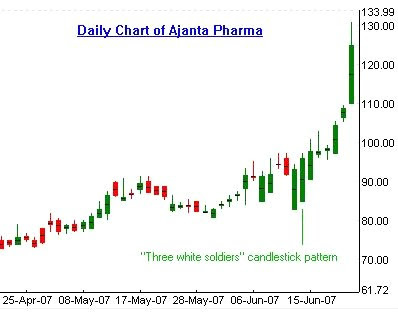 In daily charts, “three white soldiers” candlestick pattern was formed on 15/06/07 at a close of 97.70. On next Friday, 22/06/07 the stock closed at 124.90 with a weekly gain of 27.84%. Bullish in both daily and weekly charts; currently 5th wave in weekly. It has appreciated 66 times since January 2001. Like Blue Dart, this was also consolidating for 3 months before breaking out. Broke its previous support of 25.60 on 07.06.07; a case of bear trap.